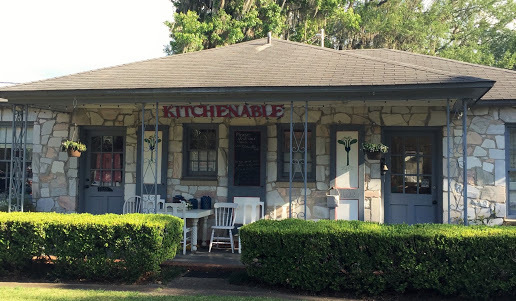 Founded in 2014 KitchenAble Cooking School and Catering occupies one of the quaint Cottages of Lake Ella. Chef and owner Jessica Bright McMullen was a farmer's daughter and learned early the importance of supporting local agriculture and using fresh local ingredients. Today she shares this philosophy with her family and friends as she teaches regularly scheduled cooking classes for all ages at KitchenAble Cooking School and through her writing and blogging. Contagious enthusiasm is the hallmark of classes at KitchenAble (and their chef). They are proud to be a part of the Red Hills Small Farm Alliance and share custom tea, signature seasonings, and prepared food that is made using locally produced ingredients whenever possible. Since opening this business all of the McMullen family has been involved in the adventures of the responsibility. Though he has a “day job” (where he says he goes to “rest”), her husband Chris is often her side-kick and sous chef for classes and events. Her children Max and Madeline tolerate the responsibilities of dishwashing because there are always dishes! Of course there are perks, like leftovers and “research” at local farms and markets… including a recent trip to Brittany France where they enjoyed le Marché daily and were immersed in a culture that greatly values their farms and farmers. Visit us online at www.kitchenable.net to see what’s happening in our kitchen.